The architectural monument of Harichavank is situated in the village of Harich in the Artik District, on a cape formed by shallow ravines and the rivers flowing in them. In the village known since the second century B.C. there survived ruins of ancient fortifications. On the cemetery there are ruins of a small single-nave basilica of the fifth century with annexes in the sides of the altar apse and interesting tombstones with ornamented slabs of the 5th—6th centuries, now at Armenia’s State History Museum in Yerevan. The founding date of the monastery is unknown, probably it was built not later than the 7th century when its first church was erected. At the end of the 12th century Princes Ivane and Zakhare (Zahkarids) bought Harich from Princes Pakhlavuni and built a new church, fortress walls and a number of service premises. The privileges granted by the princes to the monastery contributed towards its becoming a large cultural and enlightenment center of medieval Armenia. At the end of the 12th and the beginning of the 13th century, two monumental gavits (narthex) were built there of big stones, some measuring 3.5 meters. Over 800 years the monastery was repeatedly reconstructed. Damages inflicted on it were repaired and small annexes and chapels were added to it at various times. The largest of these date back to the second half of the 19th century after Harich was made the summer audience of the Katholikos of Echmiadzin in 1850. The monastery grounds expanded northwards and were encircled with walls and towers. New one- and two-storey structures were erected: Katholikos’ offices, a refectory with a kitchen and a bakery, a school, a hostel for monks and disciples, an inn, stores and cattlesheds. Greenery was planted in the yards. 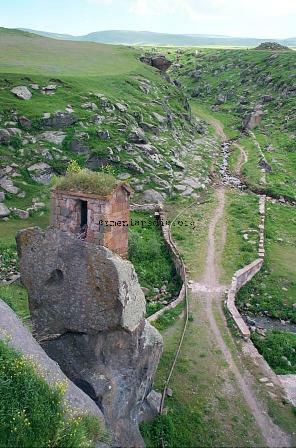 A distinctive feature of Harich, which places it in a class by itself among similar structures of Armenia, is the absence of a graveyard on its territory. The first church of St. Gregory was of the cross-winged dome type and dated back to the 7th century. The apse wings of the cross are semicircular inside and pentahedral outside, as in Mastara and Artik. The central part, square in the plan, is roofed by means of original pendentives with a tremendous 12-hedral cupola which imparts to the interior a majestic appearance. Just as in Mastara, the outer surfaces of the walls are plain and free of ornaments. This emphasizes the severity of the edifice’s bulk. Later, in the 10th century, a one-storey annex was added to the south-eastern corner of the church and in the 13th century Sarkis Dzhon added a two-storey annex to its south-western corner. The four-pillar bell-tower with a belfry in front of the western entrance and a globular roof of the cupola appeared in the 19th century when the monastery was expanded. The second, main, church of Astvatsatsin was built in 1201. It belongs to the type, widespread at the end of the 12th — the beginning of the 13th century, of outwardly rectangular and inwardly crosswinged domed buildings with two-storey annexes in all the four corners. The lateral sides of the western annexes, which border on the church interior and to which cantilever stone stairways lead, are built as three-arched colonnades unique in the history of Armenian architecture. The interior is marked by its severe architecture. Its only decoration is a carved ornament on the front wall of the altar dais, consisting or the traditional early-13th—century motives of interwoven stalkes and stylized leaves with curls. The laconicism of the bunches of tall columns, marking the corners of the mid-cross section, and of the wall-arches with pendentives, emphasizes the graceful proportions of the interior and its upward orientation to the cupola. The facades are different — their architecture is distinguished by the graphic style typical of Georgian monuments. The upper parts of the facades is covered with profiled braces which, skirting windows of various shapes and tops of triangular niches, form an unusual geometrical pattern crowned with crosses on the tympans. On the eastern facade even the group of the monastery founders — princes with a model of a temple in their hands (in the 19th century this bas-relief was replaced by an icon) was not included into the composition of this ornament. Various parts of the facades are decorated with rosettes, sun-dials, reliefs of a sirin-bird with a woman’s head and a crown, doves and other birds — elements of decoration spread in Armenian graphic art. An inscription on the cornice of the left part of the eastern facade says: God, show mercy to those who have done their work. Amen.” This is a rare phenomenon In Armenian epigraphy when the builders, instead of a geometrical ornament usually made on all other cornices, cut a stylized inscription in relief. The tall 20-hedral drum of the cupola is of original architecture. Initially tent-roofed, it acquired triple columns on its facets and large rosettes in the piers which. together with platbands, form an unusual decorative girder around the middle of the drum height. Later, the cupola drum of Gandzasar Monastery (1216—1238) was decorated in the same way. Shortly afterwards, Prince Vagan Khechup attached to the western side of Astvatsatsin church a vestry (before 1224) which included the northern branch of Grigory church. The vestry of the usual four-pillar type is distinguished by its vaulted roofings. The central section is ornamented with stalactites of interesting shapes, and perimetral sections are made on the principle of pendentive flat roofing composed of small stones and ornamented with carved geometrical pattern leaving the impression of a mosaic inset. Of interest is the western portal of the vestry with twisted columns and tympans, arranged in a ledge. Its star-shaped ornament is composed of fancy stones covered with geometrical carving. Such a filling of the tympanum is also to be seen in the portals of the vestries of the middle of the 13th century in Saghmosavank and Dzekh. South of Grigory church there are ruins of another vestry. Judging by the preserved northern half of the building and by the specific features of its architectural details, it was a central-cupola four-column vestry of early times, probably of the late 12th century. In the south-western corner of the monastery, on the edge of a rocky cape, there towers a small vaulted chapel of the 12th century. As a result of an earthquake, a part of the rock with the chapel on it broke away from the main territory of the monastery. Therefore, it is now impossible to get into the chapel without rock climbing. This page was last edited on 16 October 2010, at 00:55.